Courtesy of Maria Quattrone, RE/MAX @ HOME – Philadelphia. Enjoy the ultimate perks of city living in this stunning New Construction townhome in top ranked Fairmount neighborhood. 10 Year Tax Abatement included, plus a 1 Year Home Warranty. Walkers Paradise score of 94, Transit Score 82 and Bike Score of 85.This custom home is an entertainer~s dream, featuring a rear patio with grey pavers, a large finished basement perfect for a game room or theater, plus a beautiful rooftop deck with views of Center City and the surrounding city scape. The 20 ft wide, 2,800 square foot (approx.) home is appointed with energy efficient casement windows throughout which creates a warm and inviting environment, allowing for maximum sunlight exposure throughout the day. The open floorplan provides a modern feel, while the designer inspired accents and chef~s kitchen create a warm and inviting environment. A wall mounted electric fireplace creates a relaxing ambiance and provides additional heating to keep you warm and cozy during the winter months. The gorgeous chef~s kitchen features an oversized island with high-quality Calacatta quartz waterfall countertop and is equipped with a LG French door refrigerator with Door in Door feature and built-in water/ice dispenser, gas range, overhead exhaust hood, built-in microwave, dishwasher and solid wood white shaker cabinetry appointed with soft close drawers and stainless steel hardware. The patio, intricately designed with grey pavers and a privacy fence, provides an additional living area with room for a BBQ, table, chairs, with room to spare! The basement level has an expansive open layout which provides endless options for a media room, play room, or a guest suite. For added comfort there is also a full bathroom with a walk-in shower. On the 2nd floor there are two spacious bedrooms, along with a guest bathroom which features a Carrara marble double sink vanity, a ceramic bathtub with shower niche, and a custom tile surround. You will also find a large hall closet perfect for coats, storage, or linens. The Washer/Dryer closet is also located on the 2nd floor hallway, and features high-efficiency Samsung appliances. The Master Suite, located on the 3rd floor, is accessed through an oversized entryway with double doors that lead to the expansive master bedroom. The generous layout provides plenty of space for a king-sized bedroom set with plenty of room for additional seating and storage. The master suite also includes a spacious bathroom with a Carrara marble double sink vanity and a large walk-in shower with a rainfall shower head and built-in Bluetooth speaker. The large walk-in closet also features a casement window which provides ample light to get ready for your day. There is also one additional bedroom closet for additional storage. The stairwell leading to the roofdeck includes 3 casement windows which bring in light throughout the day and provide added airflow to the upper floors. The extra wide footprint of the house creates a great space for rooftop parties and entertainment while overlooking Center City and the surrounding areas Additional features include 200amp electric service, Dual Zone Bryant HVAC system, 50-gallon electric water heater, EnergyStar windows, and Schlage keypad entry. Each bedroom is equipped with AV/HDMI hookups for easy installation of TVs and audio equipment. 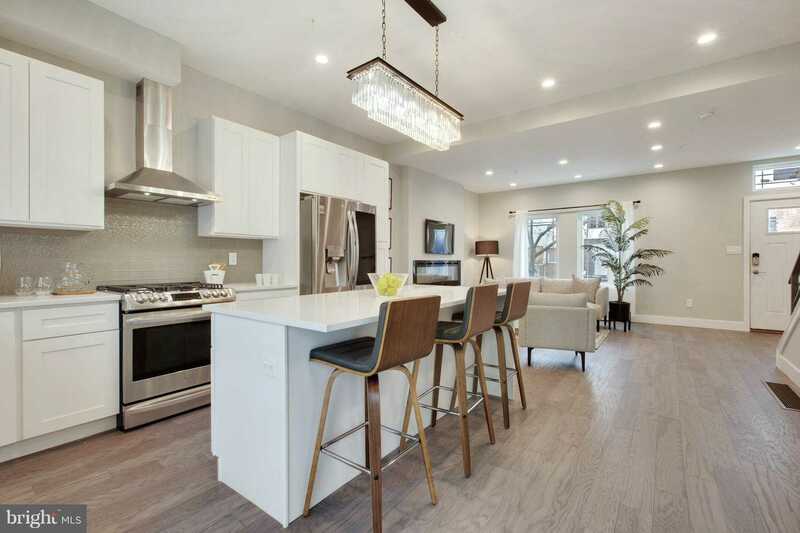 This spectacular new construction home is just a half block from buzzing Fairmount Avenue’s many restaurants, museums, cafes, coffee shops, boutiques, and public transportation, including Bar Hygge, Rybread, Tela’s Market, High Point Cafe, iPHO, Philly Flavors, Fare, Hickory Lane American Bistro, Anytime Fitness, US Post Office, Fine Wine & Spirits, Fairmount Hardware, Fairmount Bicycles.